On these page I describe how I did set-up my own home server connected to the internet via ADSL. I use this server as personal e-mail and web server. It contains only a fanless motherboard. It boots and runs from a 16 GB USB flash drive, avoiding the need for an internal harddisk and CD-ROM drive. The serial port is used as console, avoiding the use of a monitor. This is my second server, which I installed in 2007. Click here for the description of how I did install my first server in 2003, which used a fanless computer equiped with a 40 GB harddisk and a CD-ROM drive. It shall be completely silent. It is placed in my study, which doubles as a guest bedroom. So a noisy fan is not acceptable. It shall be possible to and manage from my laptop via a serial cable. I do place it in a left over corner, where I do not have the space available for a big monitor and a keyboard. It shall use a USB flash drive instead of a harddisk. Not having moving parts makes the server more reliable. It is also easy to swap the flash drive for a spare one with a spare copy of the system in case something happens. Kingston 1GB PC2100 266MHz DDR DIMM. 16GB Flash Voyager USB 2.0 Drive. This hardware (except for the flash drive) can be bought at http://www.linitx.com/. 600MHz VIA Eden Processor (Pentium compatible). 1 Microphone, 1 Line-In and 1 Line-Out Port. Of these I only needed the Ethernet Port, the Serial Port and the USB 2.0 ports. The Cubid 2699R Mini-ITX Case is a small 30x28x6cm box. It contains a fan-less 50W power supply, which gets its power from a 12V DC input. It comes with an external 100-240V AC to 12V DC power adapter similar to the ones used with laptops. To set-up the BIOS, I needed to connect a monitor and a keyboard. This is the only time the monitor and keyboard are needed. Operating system can be done using the serial port. Installing the system onto the USB flash drive can be done from any (laptop) computer. I configured the BIOS to boot from USB and to reboot automatically after a power failure. I not even considered Windows, since it is neither free nor well designed. Since I did want to have a free operating system, the choice was between one of the many Linux distributions and FreeBSD Unix. They are basically all variants of the same flavour. I have chosen Fedora Core 6 Linux. This was because I used Fedora Core 6 Linux on my previous server. Fedora Core Linux is the free version of Red Hat Enterprise Linux. It is shipped with a lot of software and is well documented. Release 5 was the latest release when I made my choice. For more information on Fedore Core Linux see http://fedoraproject.org/. Fedora Core 6 Linux is downloadable for free from many internet mirror sites. One needs to download a DVD image file, which can be burned onto a DVD using standard DVD burning software. This can be done under Windows. Linux is not needed to create the DVD. This disk is bootable. It starts a user-friendly set-up program (Anconda), which guides the user through the installation process. To connect my server to my laptop a cross-over cable is needed, connecting TXD of the server to RXD of the laptop, and RXD of the server to TXD of the laptop. The hardware handshake signals are looped back. Figure 1 shows the cable pinning. Figure 1: Serial cross-over cable. I got a single public IP address 82.161.42.40 from my internet provider. My internet provider (forward and reverse) maps this IP address to the name ip52a12a28.xs4all.nl. My home network is connected to the internet via an Alcatel Speedtouch 510 ADSL modem. This modem provides Network Address Translation (NAT), Dynamic Host Configuration (DHCP) and a name server (DNS). It can connect to up to 4 ethernet devices via it's build-in hub. 10.0.0.138 is the internal IP address of my ADSL modem. 10.0.0.201 is the internal IP address of my laptop. 10.0.0.254 is the internal IP address op my server. When IP packages pass through the ADSL modem, these internal IP addresses are translated into my public IP address and back. For traffic originating from my home network, the network address translator knows from which internal IP address the session originates. That way it is later able to send the response back to the right internal IP address. For traffic originating from the internet, the network address translator has a table telling which protocols are handled by which internal IP address. If it receives an IP package of which the protocol is not listed in the table, they are discarded. By doing so it provides firewall functionality as a by-product of the network address translation. For more information about Network Address Translation see "RFC3022" (). Figure 2: My network configuration. server.fwiarda.com is the name for my server. ftp.fwiarda.com is an alias to my server for ftp purposes. mail.fwiarda.com is an alias to my server for mail purposes. (Any mail send out by the server is sent as .....@mail.fwiarda.com). ns.fwiarda.com is an alias to my server for DNS purposes. telnet.fwiarda.com is an alias to my server for telnet purposes. www.fwiarda.com and fwiarda.com point to my private web site hosted on my server. If one registers a domain at Network Solutions, one has to specify the name servers which resolve the domain. Here I do specify ns.fwiarda.com (plus some additional external backup name servers I have rented for backup purposes). Network Solutions takes care my name servers are listed in the internet's root name servers, so clients can resolve my domain. To install Fedora Core 6 Linux on the USB flash drive regular Windows laptop or desktop computer is used. The server hardware is not needed for this. A 100 MB bootable FAT16 (DOS) partition at the beginning of the drive. On this partition, the SYSLINUX bootloader will be installed. A ext3 (Linux) partition filling the rest of the drive. This partition will be the root volume on which Linux is installed. Note that we do not make a swap partition. Swapping to a flash drive is a bad idea, since flash memory can withstand only a limmited number of write cycles. Instead we have choosen to use an abundant 1 GB of RAM, making swapping not necessary. Linux boots up from the DVD and starts a shell. The flash drive should be /dev/sda. Double check with the command ls /dev that /dev/sdb does not exist! The newly created partition will be formatted while installing Fedora Core 6 Linux with the Anaconda installer. During this installation proces the ext3 (Linux) partition will be created as well. Linux boots up from the DVD and starts the Anaconda installer. The VIA Eden processor is Pentium compatible. The computer used to install Linux on the USB flash drive is installed might have a more advanced CPU. The i586 option forces the Anaconda installer to install a Linux kernel optimized for a Pentium CPU instead of the more advanced CPU. Installation language set to English (English). Keyboard set to US English. - A file system on /dev/sda2 with mount point / of type ext3 with the maximum allowable size. Both filesystems must be formatted before use. No boot loader must be been installed. Machine name was set to server.fwiarda.com. All software packages except Fedora Extras (internet downloadable packages) are selected and customized now. - Development Tools / Frysk. These packages needed a kernel optimized for a more advanced CPU then a Pentium. If we would select them the Anaconda installed would ignore the option i586 entered at the boot prompt. The Anaconda installer first creates and/or formats the needed partiotions. Then it installs Fedora Core 6 Linux. This takes a couple of hours. Now the USB flash drive is ready to be booted for the first time. At first boot the graphical user interface is started and we have to answer some questions. Because the target server hardware uses a serial console instead of a graphical display, the USB flash drive is booted the first time on the computer used to install it. Note that this points to the second entry in the syslinux.cfg file. In this entry console=ttyS0,19200n8 is missing, so no serial console is used. 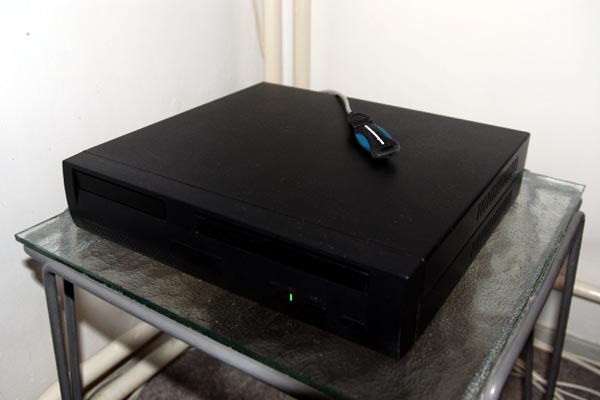 If the computer used does not support booting from USB a special boot CD can be used instead. This boot CD fulfils the function in the boot process that otherwise would have been fulfilled by the bootable DOS partition on the USB flash drive. Click here for an .iso file to be burned onto a CD. Boot the computer with this boot CD and the USB flash drive inserted. Do not change the date and time. Do not create a user account was. After filling in the firstboot screens the system reboots. The USB flash drive is now ready to boot-up our server with it. The USB flash drive is now put into the server. The server is connected with the serial cross-over cable to our Windows computer. On the windows computer we run a VT100 terminal emulation program (like Kermit 95). The serial port settings are 19200 baud, no-parity and 8 data bits. When the server is powered up it boots from the USB flash drive. We get the Linux login prompt at our terminal emulator. Further configuration must be done while logged in as root. In the remainder of this page we do edit a lot of files. It is a good practice to make a backup copy of the original file with a .old extension before editing. The changes in this section are fine tunings which are a matter of personal taste. The system will work fine without them. # Group and world do not get write permision on newly created files. # Define the equivalent of DOS commands as aliases. alias dir="ls -l -L -p --time-style=long-iso"
# These changes reflect my personal taste. alias l.="ls --color=never --time-style=long-iso -p -a"
alias ll="ls --color=never --time-style=long-iso -p -l"
alias ls="ls --color=never --time-style=long-iso -p"
# whole history file on shell exit. # A VT100 is a subset of of the ansi definition and more reliable. # actually the backspace character. # Define the prompt to be "user@host:directory $". # Use the global vi preferences file. # Man shall look for man pages in /usr/local/share/man as well. # If it exists, add ~/bin to the path as well. # Login shells seem to fail to run ~/.bashrc, so we do it explicitly. # User specific aliases and functions. # Windows style command line editing. # to be able to re-map the delete key. # Re-mapping of some keys that where not mapped well. # actions under the these keys. # Ask for the mail subject when accepting mail from a terminal. # Terminate mail input with a line containing a single dot. # to the mbox file. # is aborted with ctrl-C.
# Don't display Received headers. Two additional user accounts are created. The account server is used for administrative purposes, like storing the web pages with usage statistics. The account fwiarda is my personal account. My personal web site is stored under this account. I do receive my personal e-mail on this account. I mount the home directory of this account as an additional drive on my PC. useradd server -c "Server Administration"
useradd fwiarda -c "Frits Wiarda"
Note that with the chmod commands I make users home directories readable for all. The default for Fedora Core 6 Linux is that users home directories are strictly private. I consider this not handy since my users are myself in different roles, and now and then perhaps a well trusted friend. After installation the root mail is flooded with mail containing all kind of periodic reports. So I consider it desirable to clean all crontabs, and then add the things I consider useful. Crontab is a feature which periodically executes certain tasks. There are two types of crontabs, user crontabs and system crontabs. User crontabs are managed with the command crontab. By default telnet is disabled on Fedora Core 6 Linux. To enable it edit the file /etc/xinetd.d/telnet and change disable = yes into disable = no. The change becomes effective after the xinet-daemon has been restarted, or after a system reboot. The renaming of these files makes that the FTP server is started during system boot. By default Fedora Core 6 Linux disallows root login via FTP, since it is considered insecure because FTP uses unencrypted password verification. To change this the file /etc/vsftpd/ftpusers is edited. The entry root is removed. The renaming of these files makes that the DNS server is started during system boot. A directory /etc/named is created to store our zone files. I do not like the Fedora Core 6 Linux default /var/named. Having all configuration files in the /etc tree makes it easier to backup the servers configuration. The root hints file /var/named/named.ca is copied to /etc/named/named.root. This file contains references to the internet's master name servers. It is advisable to check yearly for updates of this file at ftp://ftp.rs.internic.net/domain/. For each domain for which we have the authority, we have to create a zone file resolving that domain. Since my server is connected to the internet via a network address translating (NAT) ADSL modem, different IP addresses are needed to approach my server from the internet and from my home network. From the internet my server has to be approached with the public IP address 82.161.42.40 provided by my internet service provider. The ADSL modem translates this address into the internal IP address 10.0.0.254. If I approach my server from my internal home network, I have to use the internal IP address 10.0.0.254 directly. Since my DNS has to return an internal IP address to clients locally on my home network (e.g. my laptop), different views are created. My DNS will return different information to request from local clients compared to requests from clients on the internet. Ofcause the above requires that I specify my own DNS server 10.0.0.254 as the prefered DNS in the network configuration of all my local clients. That can be done either by editing the network settings for each client, or by editing the settings for the DHCP server in the ADSL modem (not possible on older Alcatel SpeedTouch 510 models). The domain fwiarda.com must be resolved for requests from both local clients and from the internet. The sub-domain ip52a12a28.xs4all.nl must be resolved for requests from local clients. Requests from the internet are handled by my internet service provider XS4ALL. They are not willing to delegate authority for this sub-domain. Neither is it necessary for me to have that authority. After all I do not use any sub-sub-domains to this sub-domain. @ IN  MX    0    mail.fwiarda.com. @ IN  TXT   "v=spf1 mx -all"
mail.fwiarda.com. IN  MX  0    mail.fwiarda.com. mail.fwiarda.com. IN  TXT     "v=spf1 mx -all"
mail.fwiarda.com. IN  MX  0    mail.fwiarda.com. Note that I have not used my regular e-mail address fwiarda@fwiarda.com in the SOA record , but the e-mail address fwiarda@xs4a11.n1 (which is written in SOA format as fwiarda.xs4all.nl), which I got from my internet service provider XS4ALL. If there are problems with my name server or my domain, it is likely that my e-mail address is experiencing problems as well. Therefore I use my e-mail address fwiarda@xs4a11.n1 for things like domain registration and maintenance. Normally this address is forwarded to my regular e-mail address fwiarda@fwiarda.com, but when I am experiencing problems I can cancel this forward and use the fwiarda@xs4a11.n1 address to communicate with the helpdesk. The changes in this section become effective after the named-daemon is started manually or after a system reboot. The renaming of these files makes that the the POP3 and IMAP server and the deamon needed for authentication are started during system boot. To mail delivery I have edited the file /etc/sysconfig/sendmail, and changed QUEUE=1h into QUEUE=10m. This change makes that the mail queue is processed every 10 minutes instead of every hour. When hosting additional e-mail domains, a tab-separated list of e-mail addresses and the local mailboxes or aliases on which they must be mapped must be added to the file /etc/mail/virtusertable. Leaving the part of the e-mail address before the @ sign away maps the entire domain. Note that all domains for which e-mail can be received must be listed in the file /etc/mail/local-host-names. For more information about e-mail see the book titled "Sendmail" (). Besides the lines above, I have added some personal rules to the file /etc/mail/spamassassin/local.cf . These rules are outside the scope of this document. Fedora Core 6 Linux does not come with a vacation program, to auto-reply to your mail. I have written a perl script myself, which mimics the Unix vacation program. In most aspects this script is stripped down in functionality compared to the Unix vacation program. However, with the handling of .forward files it is more advanced. If a .forward file already exists and contains forwards to something else then vacation, it adds a line to the original .forward file instead of overwriting it. Later, when vacation is disabled, this line is deleted again. This behaviour leaves other forwards intact. The renaming of these files makes that the Apache web server is started during system boot. Note that we also rename the files from *15* into *86* This ensures the Apache web server is started after the name server has been started. In that case it is not able to resolve the host names used in it's configuration file. # Set my e-mail address as the server administrators e-mail. # Set the name of the server. # We listen on port 80 for HTTP and on port 443 for HTTPS. # The following options are necessary for HTTPS. # We set the documents defining a directory index. DirectoryIndex "index.htm" "index.html" "index.txt" "index.cgi" "index.php"
# contents instead, by commenting the corresponding directives out. # We define the format of directory listings. # the corresponding directives out. # in a special directory for cgi-scripts. # We do not want .htaccess, .htpasswd and .htgroup files to be displayed. # we provide pages. This makes our log files more readable. # We set the error log file. # We set the access log file. # manual, by commenting the corresponding directives out. # We define we are going to use name based virtual hosts for HTTP. # use a trick. We change "https://" in the URL into "http://"
# request to itself as an HTTP request. # it has it's own error log and access log files. # The entry for calls to http://server.fwiarda.com/ . # own, error log and access log files. If there is any flaw in file access permission settings, they will become clearly noticeable. The htpasswd program prompts for the appropriate passwords. For more information about the Apache web server see "Apache; The Definitive Guide" (). Webalizer is a tool for generating usage statistics for web pages. # We will specify the log file at the command line. # The entry LogFile is commented out. # We will specify the output directory at the command line. # The entry OutputDir is commented out. # contain the data for previous months. # contain the data for the current month. # by adding the -Q option at the command line. The smbpasswd program prompts for the appropriate password. For more information on samba see "Using Samba" (). After running a server for some time, one will discover in the log files that hackers are trying to discover passwords by just trying out huge volumes of passwords. To make this kind of attacks more difficult it is wise not to use easy to guess passwords like regular words from the dictionary. The best passwords consist out of letters, digits and other characters. To make brute force password hacking even more difficult, I have installed fail2ban. Fail2ban scans the log files for failed login attempts, and blocks a couple of hours the IP addresses from which to many failed login attempts are made. It uses the iptables command to discard all IP packets from these IP addresses. That makes my server totally unreachable from these IP addresses, stopping the attack after a few attempts. Click here for the files needed to install fail2ban. Just copy the files in this archive to the server. Run level 0. Halt the system. Run level 1. Single user mode. Run level 2. Multi user mode without NFS. Run level 3. Multi user mode with NFS. Run level 5. X11 graphical user interface. Run level 6 . Reboot the system. When the system boots, it reads from the file /etc/inittab to which run level it should switch. It will then run the startup scripts for this run level (see /etc/rc.d/rc?.d). Linux records in the filesystem information about when files were created, last modified as well as when they were last accessed. Recording the last access time means that for every read operation a write operation is needed as well. This has a performance penalty, especially on flash drives. Flash drives are much faster while reading then while writing. The life span of flash drives is also limmited to a certain number of writes, making a write for every read undesirable. To be able to reach my server from the internet, the some NAT settings must me made in the ADSL modem. The easiest option is to set the default address to which IP packages from the internet must be routed to the servers internal IP address 10.0.0.254. Now all IP packages from the internet are send to the server. TCP port 21 for FTP. TCP port 22 for SSH. TCP port 23 for telnet. TCP port 25 for SMTP. Both UDP and TCP port 53 for DNS. TCP port 80 for HTTP. TCP port 110 for POP3. TCP port 143 for IMAP. TCP port 443 for HTTPS. TCP port 20000 to 20999 for FTP passive mode data. IMAP Internet Mail Access Protocol. POP3 Post Office Protocol version 3.